The perfect carrying case for the JUUL vapor product. Buuk made this product inspired by JUUL freeing so many from cigarettes for good. BUUK has been tested in back pockets, purses, backpacks, and been to Coachella and back. It's versatile and tough, but gentle on the goods. The perfect carrying case for the JUUL vapor product. 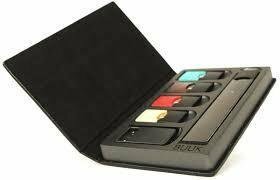 BUUK LEATHER CARRYING CASE FOR JUUL is the ultimate Juul carrying case.